This is the pose that Shrike should have. Instead, we've got something along the lines of a flailing ballerina/wrestling move gone wrong. Now I know why people go out of their way to convert their own version. 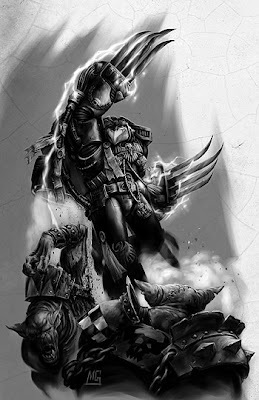 Even the GW artwork has got a better pose than the model. This is a little better, but nothing like the dynamic action pose we all have in our minds while were reading the background on this guy. We want coolness. So... it's my job to make this coolness. Naturally, I'll be posting pics of my progress on this little project for you all to follow like everything else. I'm going for a pose like Wolverine at the top. Something that says "I'm going to cut you to shreds" and not "Please catch me in your arms when I jump." This is where I'm at right now, I've got a ways to go. My Client has given me the go ahead to make him look like the Wolverine pose at the top. Expect to see more of this guy in the coming weeks. 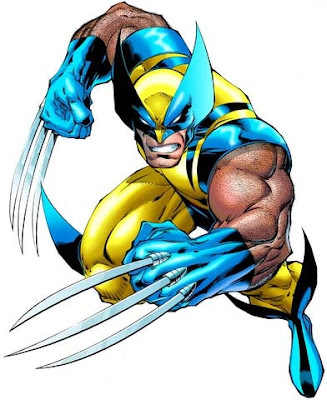 Will the claws be poping out of the back of the hands like the traditional Logan? Can't wait to see Shrike looking as he should. 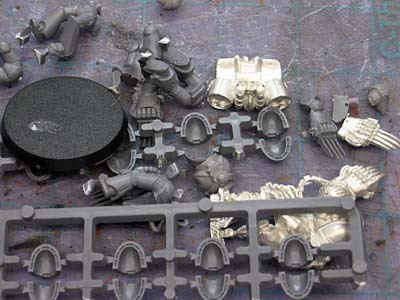 As an old time Raven Guard player, I'm really looking forward to seeing the conversion! Derina: No... He'll have regular lightning claws. I'm just using the pose. Can't wait to see this Ron! Awesome. I've been trying to figure out how to make a TL-LC Captain for a while now...my mental block has been around the lack of Lightning Claws for power armored folks. I'm dying to know how you work this out! Cawshis Clay: I think I've got it figured out. Don't worry, I'll be postting the step by step for each part of this conversion. This looks interesting. Can't wait to see the results!